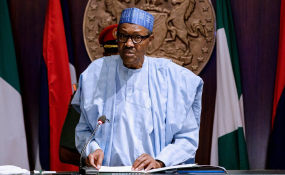 President Muhammadu Buhari has disclosed in an interview that his government would soon launch a special anti-corruption tribunal that would have the powers to seize cash and assets of Nigerians convicted of failing to explain how they came about their humongous wealth. "They will be asked to prove how they acquired the difference, otherwise, everything will be taken away and they will be prosecuted," Mr Buhari said in an interview with Voice of America as part of his recent visit to the United States. The president said he will carefully select the judges for the tribunal and "give them time and necessary evidence such as the bank balance and properties owned by individuals in comparison to their wages." The president made the comments when asked about the status of his anti-corruption efforts and why no one in his administration has been arrested by the EFCC despite allegations of corruption. The Minister of Transport, Rotimi Amaechi, was indicted by a judicial panel in Rivers States following claims he mismanaged public funds while he was governing the state from 2007 to 2015. The Chief of Army Staff, Tukur Buratai, was also exposed as owning properties abroad worth obviously more than he would otherwise have been able to afford with his salaries. The president said if his officials are arrested, they should face the consequences. "Well, there is no any other measure other than to ensure that whoever is arrested is prosecuted for all to see," Mr Buhari said. He conceded the argument of his critics that his government had performed bellow expectation in ensuring timely arrest and prosecution of possible looters. "We should have had a lot more arrests and prosecution by now; EFCC has done a lot; they will investigate and send accused persons to court and Nigerians would be adequately informed. Those who are saying we have not done enough in that regard are right," he said. Mr Buhari had muted the idea of setting up special courts to handle corruption cases since assuming office in 2015, but little progress had been made in this regard. "By the time we set up these special courts and prosecute offenders, I am sure citizens will know that we are serious," he said. "Those who embezzle public funds should be ready to face the consequences." "What we don't want is to take people to places where the judges may not be able to convict them appropriately," he added. Considering that the country has less than 10 months before the next general elections, Mr Buhari's special courts may not come on stream until his second term, should he get it. Read the original article on Premium Times. Copyright © 2018 Premium Times. All rights reserved. Distributed by AllAfrica Global Media (allAfrica.com). To contact the copyright holder directly for corrections — or for permission to republish or make other authorized use of this material, click here. Why Is Nigeria's Buhari Visiting London This Time? Nigeria: Are Ministers Any Different From Buhari?